When creating a catalog, a price list or a campaign paper, data does contain every infomations available. But for some production that’s not enough. Part of the data could be missing in relation to the graphic production, like the correct link/locations to the images. If your images reside within folders and subfolders, and more subfolders this is the tutorial you will need to read. In this tutorial we will take a look of how a script can manipulate the data source to include the full path to the images, just by using the ItemNo or ProductCode as a search term. What is a Pre Script File? The project settings we are using in this tutorial is the “Bikes demo” project which is included in a standard installation of both Cacidi Extreme and Cacidi LiveMerge. Start by downloading the script for the tutorial here. First create a copy of the “Bikes demo” project, by selecting the “Bikes demo” project and the choosing New in the popup menu in the top/left corner of the Project Settings dialog box. Now remove the Image path to the images, so it’s left empty. 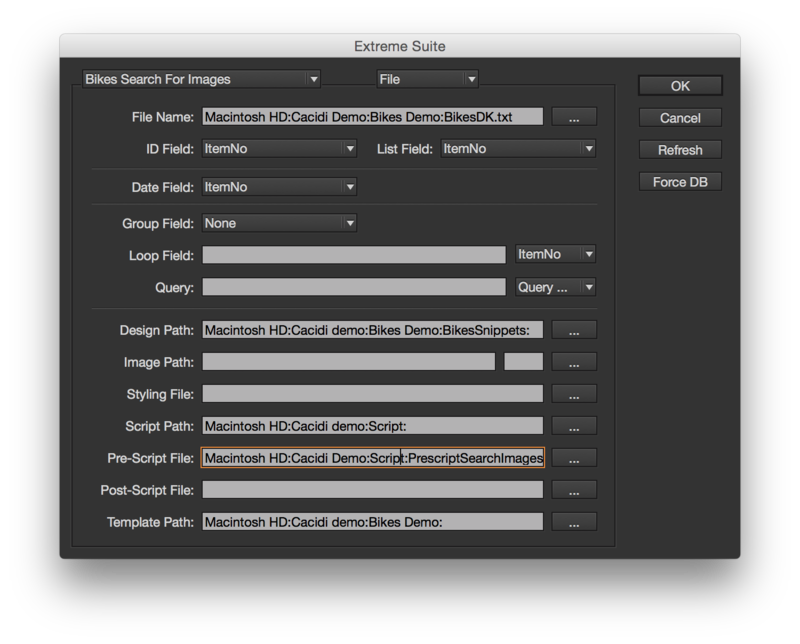 Select the script you just have downloaded in the Pre-Script file part of the dialog. The contents of the Pre-Script file should now contain the full path to the script, but you will manually have to add two different information/arguments the script need to run. The information is added to the file path to the script, within a bracket like this. The search will include the full name of the file, which means that if you have multiple files connected to the search, all images will be find, and added in the ordre that they are found. Save the test design, and drag the item from LiveMerge, or create a small step-and-repeat production with Extreme. Searching through i large harddrive with thousands of images can be a time consuming task. The pre-script and data are cached when used with LiveMerge, so the first time you drag a snippet to the page the search is performed, and you will notice a great improvement for the next snippets to be dragged.